Construction projects are very lengthy and complex. No construction project can be over before a considerable period is completed. The number of aspects that are involved are huge and of varied nature. So that such projects are dealt with success and are completed on time a certain planning is to be done and maintained. It for this purpose that the construction phase plan templates can be used. This is a format that will reduce the work of the project manager and make it more organized.You may also see Plan Templates. 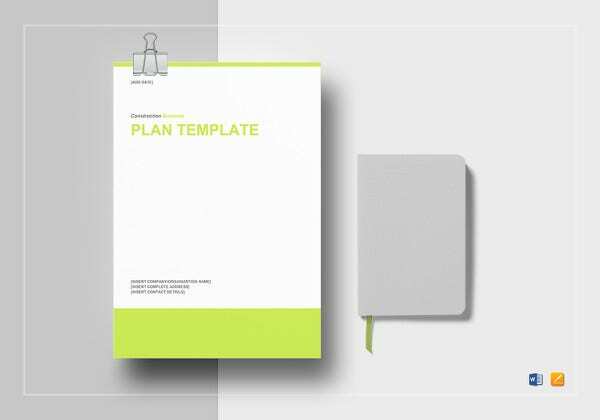 See More:Project Plan Template, Construction Management Plan Template. 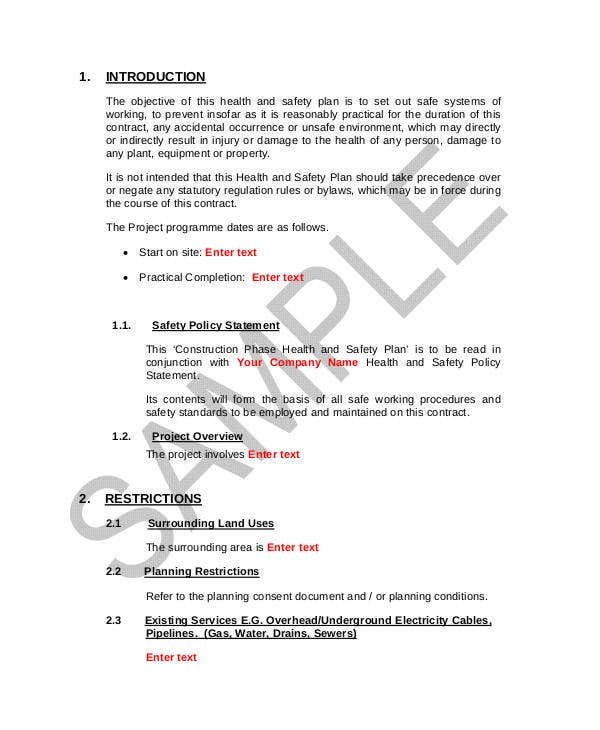 hse.gov.uk These templates are perfect for the purpose of creating a well structured construction phase plan. These designs will be very useful for the purpose of mentioning the various stages that are included in the process of the construction. The templates help to keep all the aspect of the project aligned. At the same time this sample can also provide important tips to the user in terms of the rules to follow to create an effective plan. veritas-consulting.co.uk The formats of these layouts are perfect to support a plan that is to be mentioned in details. The design of the formats will support paragraph style writing. At the same time important points can be mentioned in bullet form and can be highlighted. The background theme of the templates is simple and elegant. They can be changed as per requirement. newport.gov.uk These construction phase plan templates have unique and attractive look as the format is neat and tidy and gives a very organized feel. The entire plan is in the form of a table. Each of the section has the information of the name and the contact details of the client, the CDM coordinator, the contractor and also the architect and the administrator. These formats will contain the plan in its various phases. They have a great resolution that offers brilliant quality printouts. 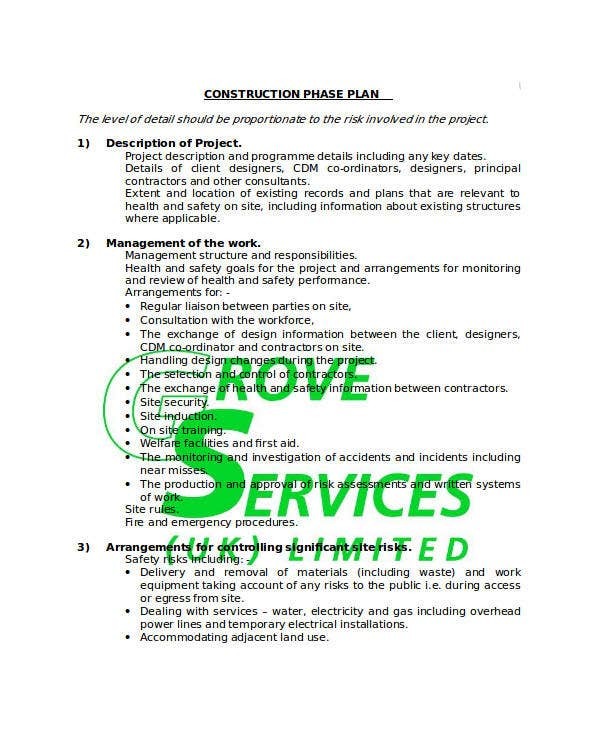 There are health and safety consultants for constructions who do design the phase plans and recommend the proper measures to be taken before the integration of the whole project. 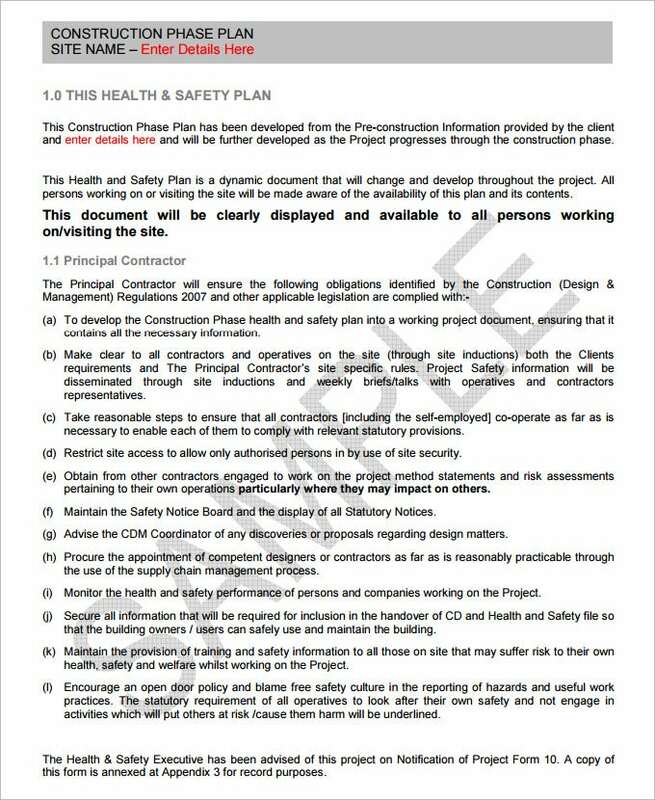 Construction health and safety plan examples and pre-construction health safety plan templates help a lot in these scenarios. They also empower the consultants to make the designing procedure brisk and smart. 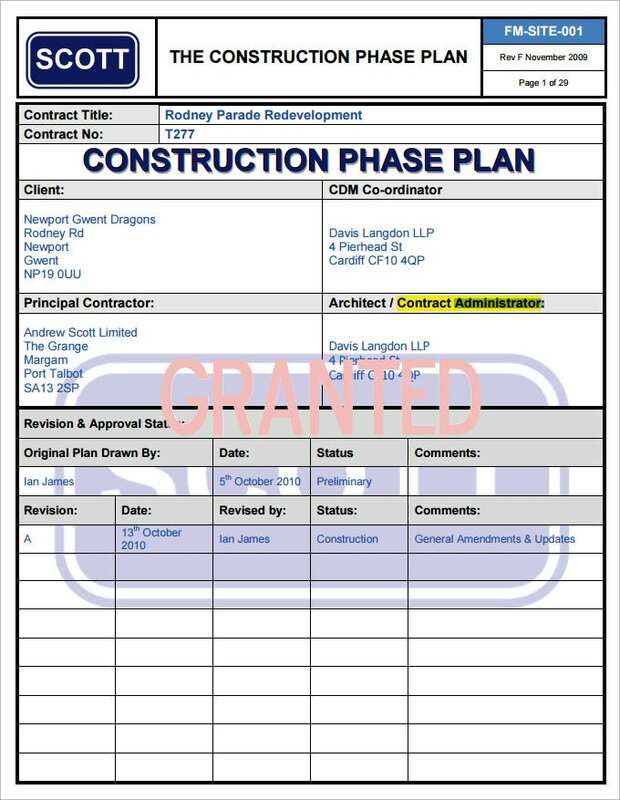 What is a Construction Phase Plan Template? 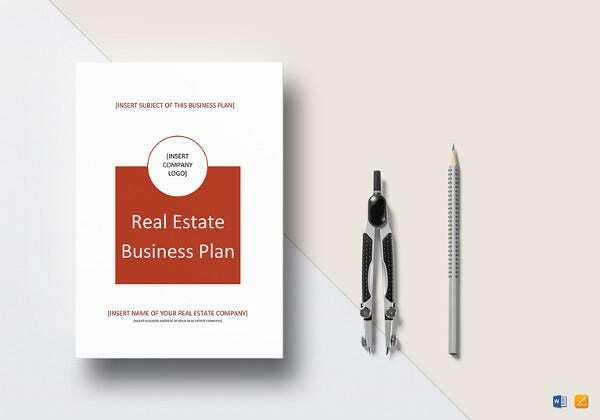 A construction phase plan template is one that can be used for the purpose of creating a plan for the construction project. This helps the manager of the project to have an overall idea of the various phases through which the project is to be continued and they completed. It helps the project to remain streamlined and aligned. How Do You Create A Construction Phase Plan Template? This is a rough cut of the actual process that is to be followed. This is a template that is to be followed by the manager so that the project can be continued in a streamlined manner. Hence the documents has to be very precise and to the point. The design must bear no extra baggage. The most important benefit is that the entire project is at the finger tips of the manager. The manager gets an idea of the various issues that might need to get handled at the same point of time. This plan beforehand can save a lot of time and money at the time of the actual implementation. This is a tool that can help the manager to better align all his resources and hence manage a better completion. 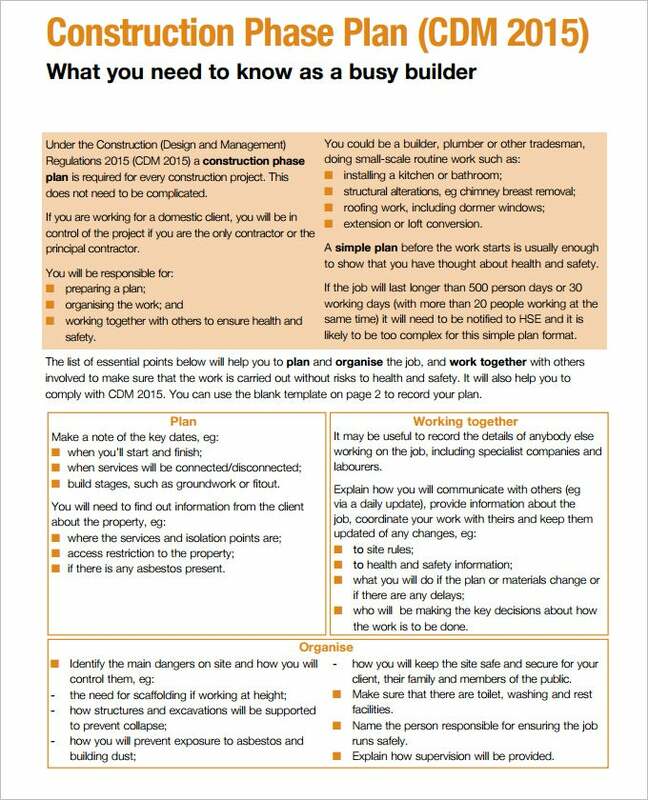 These templates provide a basic format that can help to create some really complex designs of construction phase plan management. 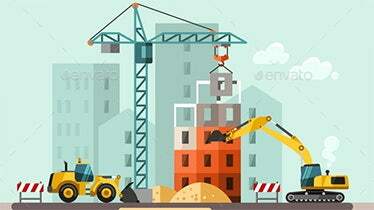 These act as a great help to the construction company employees, who can ease off their work with the well-organized plan templates. 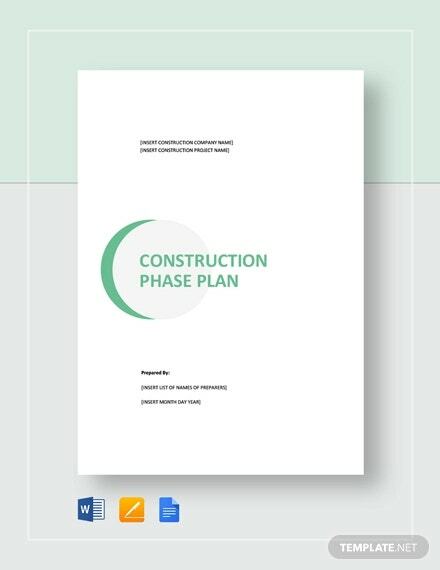 We have collected wide range of Construction Phase Plan Templates, hope these templates will help you.